The dense texture of the Wallago fish complements the richness of the fish curry with Indian spices! We Bengalis love to eat fish. Well, that’s a pretty well-known fact, isn’t it? Bengali and fish go hand-in-hand, one cannot survive without the other… err… yes, fish will survive without us Bengalis but what worth there life would be in such scenario! As mentioned in an earlier post of mine on Mackerel, I was not familiar with the ‘sea-fish’ species. 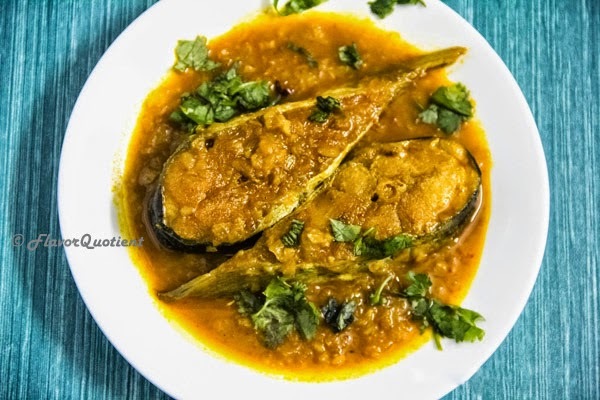 But after moving out of Kolkata, I got a scope to taste them and formed my own opinion about sea-fish which is not as biased as a typical Bengali. I like many of them and some are so good that I would prefer them over many fresh water fish, for example Indian Salmon or Rawas. 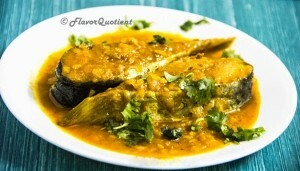 Anyways, this fish curry which is a regular member of our meals doesn’t call for any particular type of fish. You can use any fish you like, but preferably bigger fishes and it will taste as good – spicy and tangy! Wash the fish steaks well and drain as much water possible. Smear the fishes with half teaspoon each of turmeric and salt. Keep aside. Heat oil in a non-stick frying pan. Fry the fish pieces for 6-8 minutes each side. Keep them on a oil-absorbent tissue. Finely chop the onions. Heat oil in a wok and temper the oil with the cloves. As the cloves start to splutter, add the chopped onions and sauté for 5 minutes. Add the ginger and garlic paste and keep sautéing. When the mixture turns brown, add the tomato puree [or chopped tomatoes] and keep stirring. Saute it till the raw smell of tomato puree is gone. In the meantime, take a small bowl and make a paste of turmeric powder, red chilli powder and coriander powder with a little water. When the onion mixture starts separating oil, add the masala paste and fry it on high heat till all the water is absorbed and the oil surfaces again. Now add 2 cups of water and salt to taste. When the water comes to boil, add the fried fish pieces. Cover and cook on low heat for 10 minutes or till the fish are tender and cooked through. Now check the consistency of the gravy. If you want it to be thicker, cook it uncovered on high heat for 5 more minutes or till your desired consistency is reached. Remove from heat and add the garam masala powder. Cover and keep for some time. Garnish with chopped coriander leaves while serving. Enjoy with white rice.